While ecological processes often affect a scale that exceeds the limits of human perception, many ecological patterns originate from a scale that is too small to see with the naked eye: the scale of micro-organisms. From 21 to 26 August 2016, researchers from all around the world will gather in Montreal, Canada to discuss current understanding of microbial ecology during the 16th International Symposium on Microbial Ecology. Recent research on the interaction of microalgae with suspended particles in lake Markermeer will be presented at the conference by way of a poster presentation. 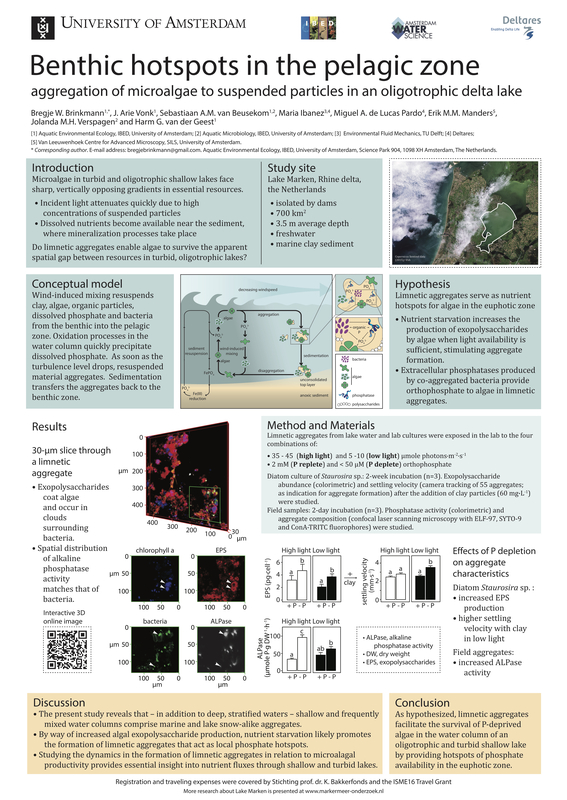 Poster that will be presented at the 16th International Symposium on Microbial Ecology in Montreal, Canada. Briefly, the presented study investigated how high concentrations of suspended particles shape microalgal survival strategies in lake Markermeer. Suspended particles quickly attenuate incident light, restricting sufficient light availability to the top surface layer of the water column. In contrast, dissolved nutrients become available near the lakebed, where mineralization processes take place. As such, we identified a spatial conflict between resources for microalgae in the lake, which need both light and dissolved nutrients to survive. Using confocal laser scanning microscopy, we identified aggregates in surface water of Lake Marken comprising, inter alia, bacteria and microalgae. Extracellular sugars embedded bacteria and algae in the aggregates, likely acting as glue. Enzymes relating to bacteria released dissolved nutrients within the aggregates. Microalgae could benefit from this nutrient release in surface waters, thereby bridging the apparent spatial gap in essential resources. Click for an interactive 3D view of an aggregate from lake Markermeer. blue, microalgae (chlorophyll a); red, exopolysaccharides; green, bacteria; white, extracellular phosphatase activity. Constructed from confocal microscopy data. Size: 140 x 140 x 30 µm. Indeed, at the lab of the University of Amsterdam we found that algae1 produce more extracellular sugars when dissolved nutrients become limiting. This suggests nutrient limitation stimulates the attachment of algae to local nutrient hotspots (aggregates) via increased extracellular sugar (‘glue’) production. In corporation with Deltares, we studied the settling velocity of algae1 with clay as an indication for aggregate formation (amongst other physical measurements). Video tracking of settling aggregates revealed an increase in settling velocity upon nutrient starvation. It moreover showed a striking diversity in aggregate shapes. A short compilation of settling diatoms, aggregated with lake Markermeer sediment. 1 A mono-algal diatom culture of Staurosira sp. – a genus that occurs in Lake Marken – was used for laboratory experiments.